Bar None’s Review Essate Writer Series are available at law school bookstores nationwide and available online at The Law Bookstore. 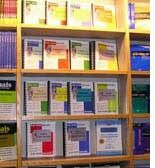 Bar None Review’s Essay Writer Series provide the most comprehensive collection of practice essay exams available. Each volume contains carefully selected essay questions designed to provide detailed coverage of the most testable issues. With Bar None Review’s exam answers students learn how to distinguish between issues and non-issues, write and apply the law successfully and test their knowledge of the law. The Essay Writer is an invaluable tool for law students. *These titles include the accompanying exam writing templates at no additional charge!